CAIRO, Jan. 22 (Xinhua) -- At least 59 militants were killed in the exchange of fire in Egypt's Sinai Peninsula in the past few days, the Egyptian armed forces said in a statement on Tuesday. "During anti-terrorist raids, the national security forces have killed 15 highly dangerous terrorists in North and Central Sinai in several desert areas in the Sinai Peninsula," said Tamer al-Refai, the spokesperson of the armed forces. He added some 44 terrorists with explosive devices and weapons in their possessions were killed in the areas of the Second and Third Field Army bases in Sinai. During the shootout, one officer and other six soldiers were killed. Some 142 criminals were arrested in the raids. The statement added 56 vehicles and two arms warehouses were also destroyed. The security forces have detonated 242 explosive devices that have been planted for targeting the soldiers in Sinai, it added. Egypt has been battling terrorist since the ouster of the Islamist President Mohamed Morsi in 2013 in response to mass protests against his rule. Sinai Peninsula is the stronghold of terrorist groups in Egypt, most severest of which is Sinai State, an Egyptian branch of the Islamic State. 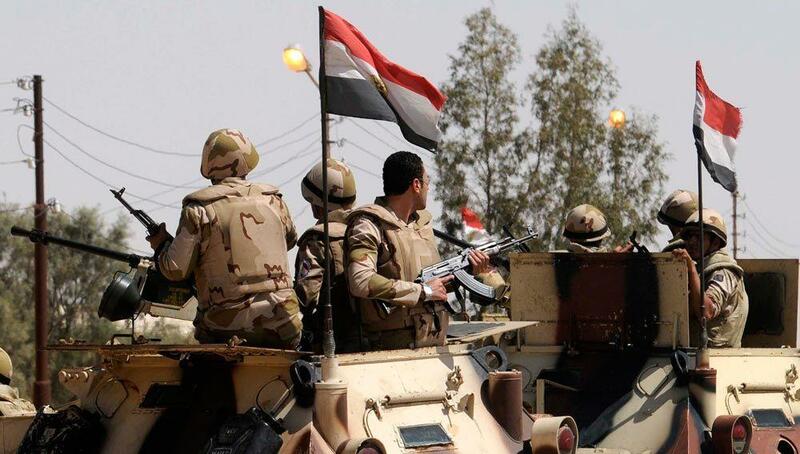 More than 800 militants and over 30 soldiers have been killed in the "Sinai 2018" anti-terror campaign since February 2018.